What to Submit: an original short story of no more than 5,000 words. Who Can Submit? all current eleventh and twelfth graders currently enrolled at Clayton A. Bouton High School. This Year’s Theme: your story must, in some way, connect to the theme of Leaving Home. 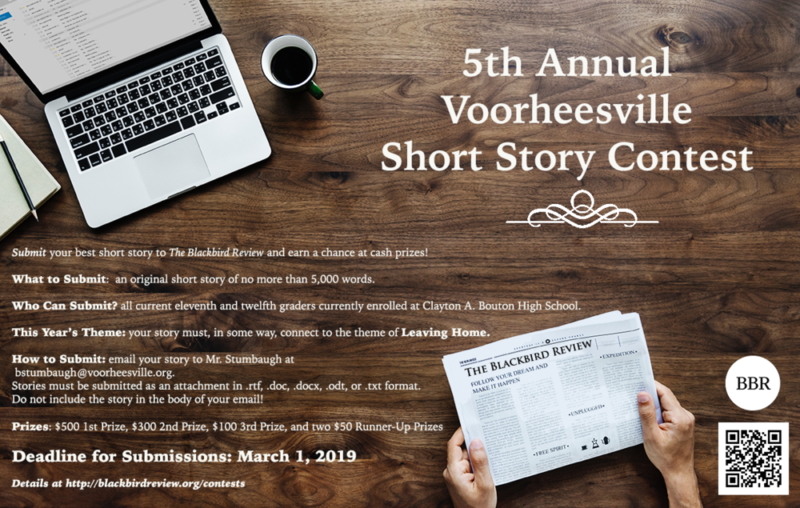 How to Submit: email your story to Mr. Stumbaugh at bstumbaugh@voorheesville.org. Stories must be submitted as an attachment in .rtf, .doc, .docx, .odt, or .txt format. Do not include the story in the body of your email! The Process: all stories will be anonymously vetted by a panel of Clayton A. Bouton faculty and staff members. The top ten stories will be sent to a panel of judges from the College of Saint Rose MFA program, where they will be judged. All stories that go to St. Rose, regardless of contest outcome, will receive written critiques from the judges. The top five stories will earn cash prizes, and will be recognized at an awards ceremony at the end of the year. Check out our blog post for Tips on Writing Short Stories! The Blackbird Review Writing Award is given to a student from the Clayton A.Bouton High School that has submitted a piece of fiction to The Blackbird Review during that school year. All published work is eligible for The Blackbird Review Writing Award and will be evaluated by a faculty panel of judges. The Blackbird Review Writing Award recipients will receive their awards at the appropriate awards night in June. Deadlines for all entries is by the publication of the Spring edition of the magazine, usually in May. The Blackbird Review Writing Award recipient will receive a $50.00 cash award.